TNPSC Question Bank for Group 1, Group 2, Group 2A and CCSE 4 and also for Group 1 & Group 2– Mains – Paper I | Paper II available both English and Tamil PDF. TNPSC Previous year Question Papers for Group 1, Group 2, Group 2A, and CCSE 4 – 2018,2017,2016, 2015 and 2014 available in PDF free download below. Group exam previous year question papers are more important for your exams nowadays. A lot of question you will get from previous year question papers. So read the previous year/model question paper and practice well, it well helps you while writing prelims and main exams. Students preparing for TNPSC Exam were in the search of TNPSC all group exams previous last 6 years question papers. There is a good news for all that is we have uploaded TNPSC previous year question bank last 6 years question papers here. 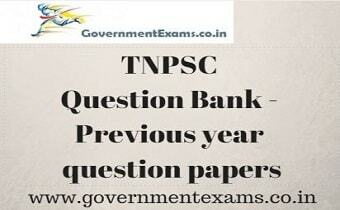 TNPSC Question paper available below, click read more link to the question bank. We also provide you TNPSC Model question papers for your upcoming Exams, Check the link given below. Group 2 Main Syllabus is given below both in English and Tamil, Click to view – TNPSC Group 2 Main Exam Syllabus. TNPSC group 2 mains exam previous year question paper answer key 2016 is available here to download with solutions and correct answers. TNPSC Group 2 Main Exam Previous year question papers PDF, click to view – TNPSC Group 2 main exam question paper. TNPSC Group Exam Model Questions & Answers Paper available for the updated Syllabus. Questions are framed by experts with appropriate knowledge in corresponding subjects. Model question paper with answers PDF for all Group Exams (Group1, 2, 2A and 4) in English and Tamil. Make use of Model question paper 2016, 2017 and 2018 (Download and read before exams), so that it helps in exams. 1. TNPSC Group 1 Model Question papers- Click here. 2. TNPSC Group 2 Model Question Papers- Click here. 3 TNPSC Group 2A Model Question papers- Click here. 4 TNPSC CCSE Group 4 Model Question Papers- Click here.